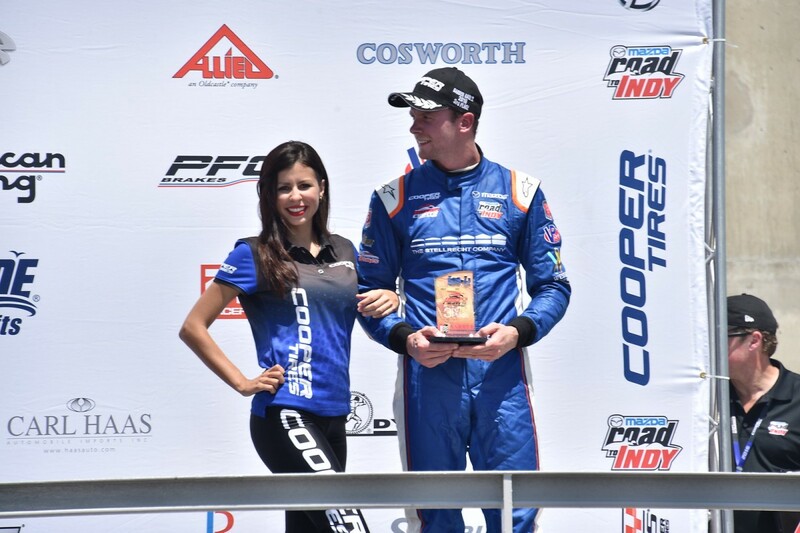 Indy Lights, Barber Motor Park, Alabama USA, 23rd April 2016 Dean Stoneman secured his first visit to the podium stateside with an impressive 3rd place in just his fifth race in this competitive championship. The Andretti Autosport driver arrived at Barber on the more familiar road track, following the streets of St Pete and oval of Phoenix, in confident mood eager to expand on his two positive performances in the series which have established him as one the leading drivers in the 2016 championship. Qualifying saw Stoneman hover around the top five throughout the 30-minute session, at one point fastest before he posted his best lap of 1.12.8564 just one and half tenths of second off pole to put him P2. Race 1 Saturday proved to be a frustrating affair for Stoneman as his car picked up an electrical issue on the parade lap which restricted him to the pit lane for the whole of the 30- lap race whilst his Andretti mechanics tried to rectify the issue. This was cruel luck for driver and team after such an impressive showing in qualifying. Sunday, with the issue fixed, hopes were high for race two as the Rookie resumed his front row position of the rolling start. As the pace car went in Stoneman began an immediate attack for the lead and almost grabbed it as the car went through turn one. From there the 25-year old was pushing hard as he attempted to edge into the lead. On lap seven, Stoneman suffered a moment of over-steer at turn six and ran wide allowing the third placed car past. But Stoneman was in no mood to finish outside the podium places and began his fight-back. As the race entered it’s final stages the Southampton based driver was significantly reducing the gap to second, but eventually ran out of laps and time to make the move he so dearly wanted. The result strengthens Stoneman’s position within the top eight in the Indy Lights series. Dean’s next race will be at the Indianapolis Grand Prix Circuit, Indiana 12-14 May.